Well, it's too late to apply for this year's marathon. Entries have been closed, invitations issued and now reserves called. But for those of you reading this blog in The Mystical Land of The Future, here is a collection of necessary information for applying and running. You can also read part 2: the race and after. 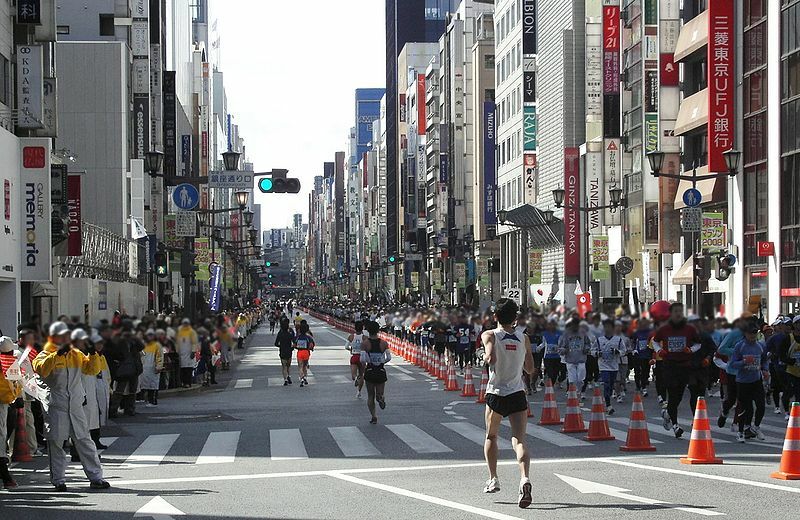 You might be interested to read the .pdf of the 2011 Tokyo Marathon race guide here. First of all, the run is held in late February every year (27th for 2011). The application period is usually the month of August, with applicants being informed of their place/lack of in mid-October. Applicants have a month to pay the registration fee (12,000yen this year if you do it in English, 10,000 in Japanese) before their place is offered to reserve applicants. Last year, almost 275,000 people applied, and only 32,000 ran. So you need some good luck to get on this one. You do not need to have previously run a marathon to get on this one. The Tokyo Marathon website will guide you through the application process when it's open. It's very simple, and in English. It asks a lot of questions about your experience level etc. I heard mixed opinions as to whether or not your answers make a difference to you chances (like if you are assigned to a group which makes up a certain percentage of racing individuals), though it may well be the case. I have also heard that there is a quota of gaijin runners to be accepted, but it's unclear if that makes your odds better or worse. The 26 mile and 385 yard course starts at Tokyo Metropolitan Government building, driving straight through Shijuku and up to Iidabashi, turning South at the Imperial Palace to take a detour through Shinagawa, passing through Ginza and Nihonbashi on it's way up to and back down from Asakusa before regaining it's straight-line towards Tokyo Big Sight, where excited people wait to wrap you in a towel. A course-map is available as a .pdf at the Marathon website. Here's the 2011 one, though it never changes, and here is one on mapmyrun.com which is much more detailed as it uses google maps. You have a 7-hour limit to complete the race. As you can see, it looks like a good chance for a PB for both 10k and the full marathon. You can also watch a sped-up video of the whole course here. For the up-and-coming/weaker runners, you can also opt to do the 10km race on the same day at the same time. You even get to run with the big boys until it finishes at Hibiya Park, just after the Imperial Palace. Entry is 6,000 yen. There's a 1 hour 40 minute limit on this race. A (very) limited number of wheelchair applicants can also race. In 2010 only just over 20 people got to do this (out of 50-something applicants). Judging by the 2010 race, there are also similarly limited spaces for visually impaired and mentally impaired runners, as well as "transplant runners" on the 10k race only. Total numbers of successful applicants in these fields total just over 200. Well, good luck if you decide to enter, and even better luck if you get to race. I'll be doing it in 2011 and will be sure to post a results entry about it. Until then I'll be pounding pavements in the mountains. You got in? What time will you be aiming for? I also applied, but I didn't get in... I'll try again next year. Thanks Mischa. Yes, I got in through the reserve entries this year, which was a nice surprise. PS I like your site - it's a very fun look at onsen around Japan. Congratulations on becoming an Onsen Master!